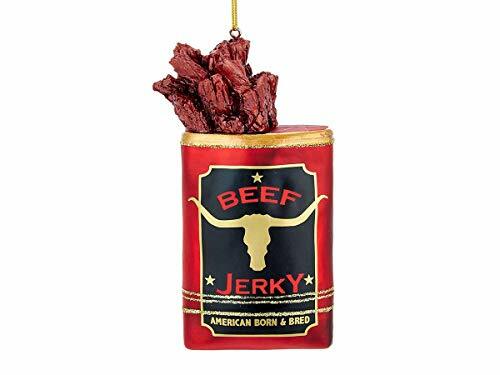 Fun and unique ornament features a red tin with the words, “Beef jerky, American Born & Bred”. Made of quality glass material with intricate detailing; Nylon cord for easy hanging. Ornament measures approximately 4.75 inches long; Exclusive from the Kurt Adler Noble Gems collection. Perfect for displaying on a Christmas tree or ornament stand as a festive holiday accent piece. Carefully packaged in a fitted box for easy gifting and storage.